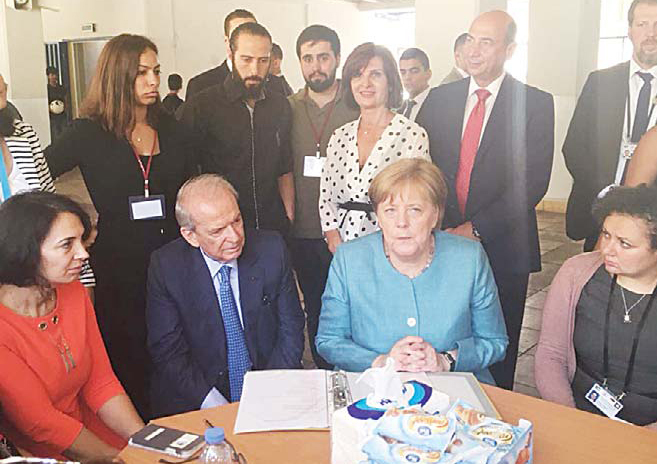 BEIRUT, June 23, (KUNA): Germany’s Chancellor Angela Merkel paid a visit to Sheikh Jaber Al-Ahmad Al-Sabah School in Ras Beirut neighborhood on Saturday and observed Syrian refugee students’ involvement in classrooms and sport activities. During her visit, Merkel toured the school facilities, viewed the education methods applied in some grade levels such as kindergarten and the fifth grade, spoke with students, in English, about their situations and needs, and took part in lecturing physics class students, Lebanese Education Minister Marwan Hamadeh, who accompanied Merkel on her visit to the school, told KUNA. The German Chancellor also visited the school’s sports arena, where she joined Lebanese and Syrian refugee students in some exercises and trainings, Hamadeh added, noting she presented them with a number of officially certified soccer balls and German national team’s jerseys. 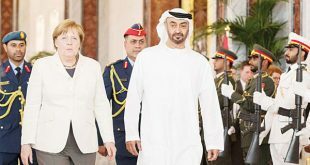 She also gathered with some local and refugee families, on one side of the school’s soccer field, and spoke with them about their issues, he said, adding Merkel stressed the importance of maintaining a good relationship between citizens and refugees. 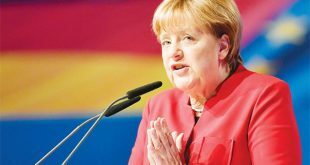 Merkel expressed her admiration for the school’s administration, education staff, students, and learning process, the Lebanese minister said, adding she also lauded the close cooperation between students, teachers, and administrators. 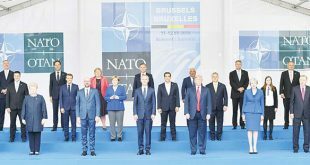 Furthermore, Hamadeh told Merkel about the ministry’s plan to observe the education of Lebanese and refugee students via (RACE) project, to be launched in cooperation with UN international agencies and bodies, particularly UNICEF, and with the financial backup of Germany and the international group. He also handed the German Chancellor a detailed report on the accommodation capacity in Lebanese state schools, which highlighted the government’s need of financial support to accommodate more refugee students. 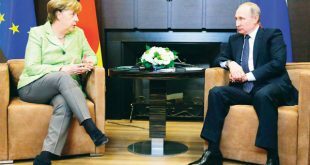 Moreover, Hamadeh explained to Merkel his ministry’s plan to employ new refugee teachers in the country’s schools, reiterating the ministry’s need for financial aid to enable it to bear the burden of educating children and minors without any discrimination. “Sheikh Jaber Al-Ahmad Al-Sabah School is considered as the ‘pearl’ of Lebanon’s education,” he said, expressing his appreciation to Kuwait’s contribution to boosting education his country. “The school is also a source of pride for the Lebanese people; therefore, we strive to hoist Kuwait’s name higher through providing the best educational methods and applications for students,” affirmed the Lebanese senior official. For her part, Ghadah Azar, Director of Sheikh Jaber Al-Ahmad Al-Sabah School, told KUNA the school has been at the forefront of Lebanese state schools, and became a hot spot for officials and visitors. Sheikh Jaber Al-Ahmad Al-Sabah School has working hours in the morning, during which it receives 250 refugee students, and in the evening, receiving 625 refugee students, noted Azar. In the last few years, the Lebanese education ministry has named several schools in Beirut after Kuwait, His Highness the Amir Sheikh Sabah Al-Ahmad Al- Jaber Al-Sabah, and His Highness the Crown Prince Sheikh Nawaf Al-Ahmad Al-Sabah. 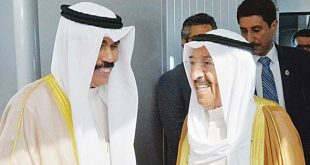 It has also named some schools after late Amirs Sheikh Sabah Al-Salem Al-Sabah, Sheikh Jaber Al-Ahmad Al-Sabah, and Sheikh Saad Al-Abdullah Al-Sabah.